Police in Manchester, New Hampshire have arrested a woman accused of stabbing her 16-month-old daughter. A New Hampshire mother is behind bars, accused of stabbing her own toddler daughter in the back. Evansgina Audy, 29, of Manchester, appeared before a judge Thursday morning. Police say the stabbing happened just before midnight Wednesday inside Audy's Candia Road home. Her neighbors can't believe it. "It's kind of heart wrenching, really," Said Tyler Eccleston. Police in Manchester, New Hampshire have arrested a woman who is accused of stabbing her own 16-month-old daughter. "Obviously a little disturbing," said Jennifer Lynch. "It's just appalling to me," said Ruth Broderick. Manchester police admit this is a difficult case to deal with. "It's tough to look at it, tough to read, but again, this is society we live in," said Lt. Brian O'Keefe. Police say Audy's husband called 911 after he woke up to find his child bloody and his wife holding a knife. When officers arrived, they found the little girl with a single stab wound to her back. They say Audy "didn't seem fazed" and at one point even "smirked and chuckled." 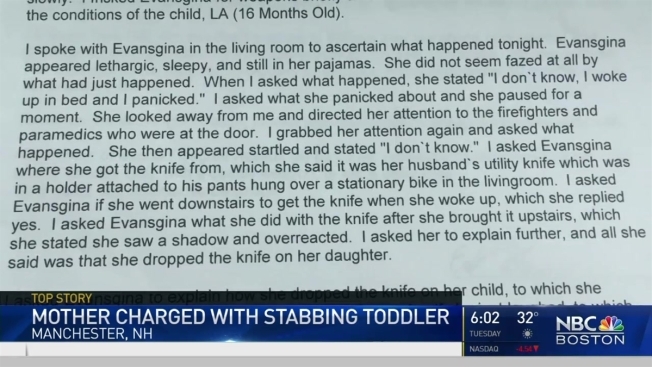 According to court documents, Audy told officers she was startled awake, grabbed her husband's utility knife, "saw a shadow and overreacted." Outside the courtroom, NBC Boston met Audy's mother. She was sobbing and too distraught to go on camera, but tells us that her daughter, Evansgina, is mentally ill and was just released from a local psych ward a couple weeks ago. "It's no excuse at all," Broderick said. "I have three kids of my own, there's no excuse." Audy is undergoing a mental evaluation and will be back in court Friday morning. Her little girl is expected to make a full recovery.